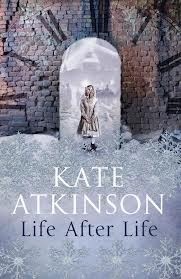 I’ve chosen a grown-up book - Kate Atkinson’s latest novel LIFE AFTER LIFE - for this January review. The novel is currently in hardback (or as a kindle edition) but the paperback is due out soon. First of all, for all Jackson Brodie enthusiasts, LIFE AFTER LIFE is not another in the Atkinson crime series. The novel spans the first half of 20th century, so it could possibly be described as historical fiction. Certainly, I felt, it is the popular “historical” knowledge of the World Wars and surrounding decades that helps to hold this unusual book together. In the very first chapter, Atkinson introduces the idea that this is a differently constructed novel: in 1930, a young English girl enters a café in Germany and attempts to shoot Hitler. Then, in the next wintry chapters, each dated 11th February 1910, we find three alternative versions of the birth of a baby girl, Ursula, including as a stillbirth. So the book continues. All through this novel, Atkinson offers alternative versions of the Ursula who survived. We see her through family childhood, during girlhood, as a young woman and wife and aunt, as an early professional career woman, as a firewatcher in the 1940’s - and on into her eventual retirement in the 60’s. The “plot” of the novel loops back time and again, retelling and revising incidents, revealing different versions of Ursula’s life and the altered relationships between the characters. Often her stories end badly, with the refrain "Darkness fell". I admit that, at the beginning, I noted down the dates and years used like chapter headings to get some hold on when we were, as well as where. The places and the people are strongly and clearly written. Atkinson writes some harsh and shocking scenes but never wallows in the awfulness. The book has moments of quiet humour. I enjoyed the way that Maurice, the older brother, is continually an unpleasant character, and the times when already known characters such as Renee, reappear as strangers. Death is sometimes a surprise but rarely a dreadful experience for Ursula. There's a feeling of relief when, after another story “goes wrong”, the novel shifts and a younger Ursula appearing, with another chance of happiness. The poignant sadness of one tale is balanced by hopeful moments in another. For example, Ursula's vindictive husband is not married on her second trip through time. Several themes re-appear, structuring the book: Atkinson writes of loneliness and deprivation; of innocence, ignorance and deceit; of childhood abuse, domestic violence and the brutality of war. In all her alternative selves, Ursula remains a constant, brave and likeable character for the reader. The book gains pace through the reader’s curiosity. How will this current loop work out? What the next story will be? LIFE AFTER LIFE is a hard style of book to conclude: Atkinson offers variations of the ending, suggesting the differences between what happens and what you would want to happen - which is, I suppose, what fiction is all about. You might be thinking, as I once did, that this book sounds a bit too bothersome to read among so many other things to do. All I can say is that LIFE AFTER LIFE works. The book is "believable" and, possibly against the odds, some of the moments stay with you. There should be hardback copies in your local library, if you don’t want to wait for the paperback - and it is available as a kindle e-book too. This was my book of last year and I do appreciate this clear and lovely review which gives a good idea of the kind of book it is. I just loved it and must read it again, I think! I have been meaning to read this one for ages, and your review encourages me to make more of an effort! It's had such wonderful reviews but I think yours has given me the best handle on what to expect. Thanks, Gillian and Adele. Feeling amused today because I wrote this review without being at all aware that Life After Life was listed for, or would win the Costa Novel Award as announced last night. Thank you, Penny. I was intrigued by other reviews of the book, but longed for an opinion from somebody I really trusted not to be 'selling' it. Now I really want to read it! This is an extremely thought-provoking book which made me exclaim out loud several times as I was reading it - either from surprise, dread or the ever-present undercurrent of déjà-vu. It seems to embody such a sense of might-have been, if only... and explores very adroitly indeed how we are fashioned by our circumstances. I loved it and have been singing its praises far and wide. I really like your review. Kate Atkinson is one of my favourite authors. I recently finished reading this book and really enjoyed it. It is true that Ursula keeps embracing life no matter what it throws at her. She has very low moments but she is a strong character. I also liked the historical parts of the story too - the Blitz, Germany, family life and I think it made the story's setting come to life. This is a book that is also a puzzle. I loved the challenge of following the time lines and hoping and praying for the best for the characters. A real page-turner, don't start reading it at midnight or you won't sleep at all!